Costa Rica is known for its abundant wildlife, often found in stunning locations, either waterside or deep in a tropical could forest. If you’re planning a wildlife exploration in this lush land, Collette offers a list of traveler favorites to be on the lookout for. Snap a few (hundred) pictures and you’ll head home secure in the knowledge that paradise is alive and well in Costa Rica. Birders, get your life lists ready. Some 600 species of birds call Costa Rica home, while another 200 species migrate there annually. Even first-timers will find plenty to look out for, including colorful Toucans, the region’s famed Quetzals, 16 varieties of parrots, hummingbirds and many other species. Looking for something specific? Your local guide can help you search the trees to find just the right nesting spot for your bird of choice. The adorable sloth has become a symbol of Costa Rica and it’s not hard to see why. These chill animals practically embody Costa Rica’s slogan, “Pura Vida.” While sloths are common, their camouflage makes them harder to spot than you’d think. No worries, your local guide knows where to look and can point out just the right spot, high in the trees. 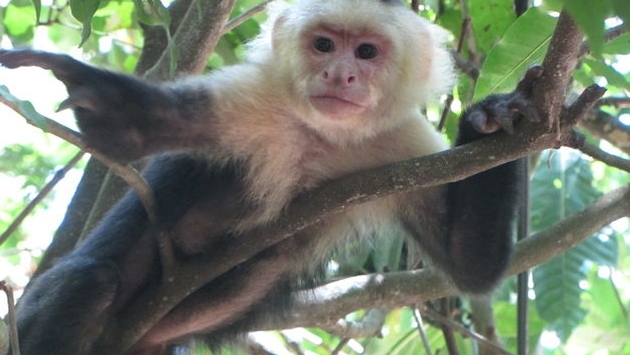 If monkeys are your thing, keep your eyes peeled for Costa Rica’s famed capuchin monkeys. Manuel Antonio National Park is one of the best bets if you’re hoping to catch these lively creatures in action. Capuchin monkeys are a social bunch that lives in communities ranging from 10 to 40 members, so if you spot one, it’s likely there are plenty more hanging out nearby. Costa Rica’s rainforests are also home to the sleek ocelot. The nocturnal kitty spends most of his days asleep in the trees, but you might be lucky enough to catch one on the move at night. If you strike out, head to one of the nation’s wildlife sanctuaries like the Monteverde Cloud Forest Reserve, for a closer look. Ready to book your own wildlife journey? Visit Collette’s Wildlife Collection to find the program that’s right for you.